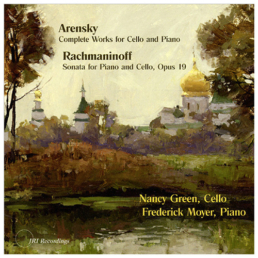 Much of Rachmaninoff’s early style can be traced to his teacher Anton Arensky, a master composer in his own right, who was especially successful in his short works, such as these six delicious works for cello and piano. Written immediately after the success of his Second Piano Concerto, Rachmaninoff’s Cello Sonata is as great a work, full of sweep, passion, gorgeous melodies and rich harmonies. This is Nancy’s and Fred’s second recording of this work, a favorite in their repertoire.